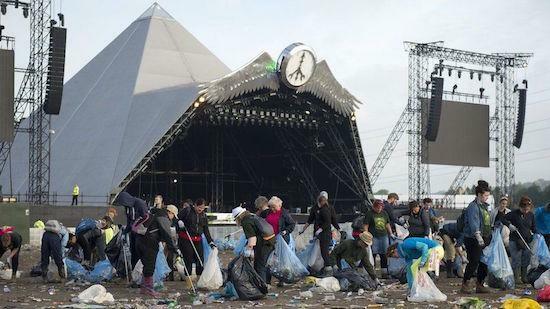 Emily Eavis has confirmed plans to ban plastic bottles from next year's edition of Glastonbury. In an interview with BBC Radio 6 Music, he said that the plan was the festival's "big project" for 2019, upon its return from this year's fallow year. A Glastonbury spokesman confirmed that plans for the ban were being put into motion but said it was "a bit early to put any flesh on the bones" regarding further details of the plans. "It's a massive thing which everyone at the festival is working on," added the spokesman. "We're working on banning plastic bottles... which is an enormous project and it's taking a lot of time to tackle it with all the different people we work with," said Eavis, speaking to BBC Radio 6 Music upon arriving at the NME Awards last week. "But that's the big project at the moment for 18, to get rid of plastic bottles across the whole site."